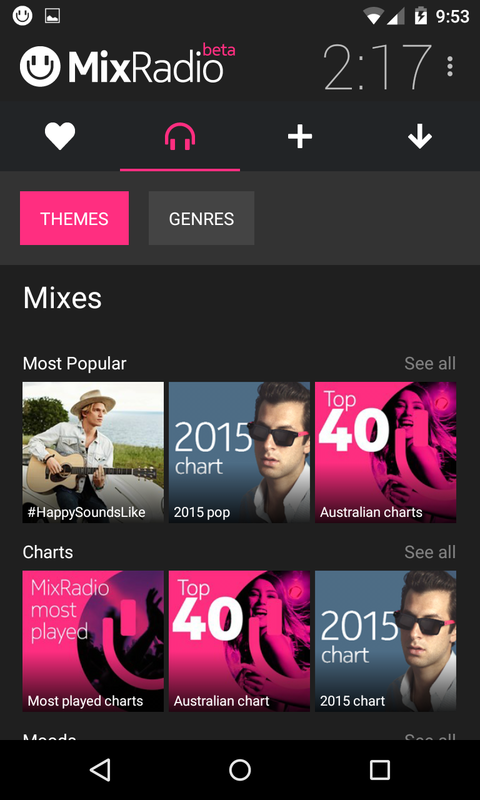 MixRadio is a music streaming service that learns your tastes to offer you personalized new music to listen to. To get started with MixRadio, you have to tell it something about your tastes. First you select your favorite genres, then artists you like from within those genres. It's easy, and MixRadio offers you a broad selection of popular artists from all genres to pick from. Once you're done, you can listen to My Mix, which has been created for you. You'll hear artists you picked alongside other artists MixRadio thinks you might like. If you don't like a song, simply tap the crossed heart icon and MixRadio won't play that song again. You can skip six song per mix - then MixRadio will suggest you listen to a different one. - Discover fresh new tracks intelligently tailored to your music tastes, as well as hearing old favourites. - Everything from the latest charts and party soundtracks, to genre specific mixes. You can even listen offline!